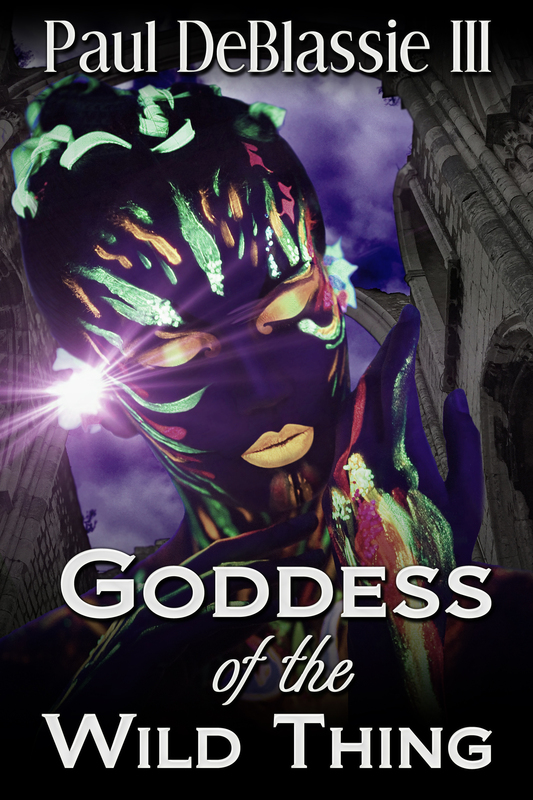 Goddess of the Wild Thing is a dramatic tale of one woman’s spiritual journey where magical happenings, unexpected turns of fate, and unseen forces influence her ability to love and be loved. Eve Sanchez, a middle-aged woman and scholar of esoteric studies, encounters a seductive but frightening man who introduces her to a supernatural world in which the wicked powers of a surrogate mother’s twisted affection threaten love and life. In the mystic realms of Aztlan del Sur, Eve and three friends struggle with whether bad love is better than no love and discover that love is a wild thing. Review: As an editor, I’m always quite nitpicky about books I read, but “Goddess of the Wild Thing” was a clever surprise. Exciting dialogue, thrilling characters and a complicated, well-crafted supernatural world, what’s not to love? Fans of paranormal thriller should definitely give this book a try. The woman was hysterical, sobbing so much I couldn’t understand her. As I pressed my cell harder against my ear, the wind sprouted claws and slashed at my meager sweater until I shivered. Phone calls used to be rare, but I’d been getting more and more since Jackson and I had gone public with what had happened to us in China. Now everyone in Vermont seemed to know my name, and they all needed help. Clutching at my sweater to keep it from being blown away, I ducked my head, shielding my face as my hair whipped around in a furious tangle. I huddled against Hildy’s shop, wondering if I should go in, but the older woman wouldn’t be impressed to see me on my phone. Her establishment was a temple, a library. The loyal customers who kept her in business spoke in whispers and walked on tiptoes. By bursting in like this and continuing my shouted, one-sided conversation, I’d have become the proverbial bull. Not good. “Miss Carlsson? Kate Carlsson?” The woman had regained her composure enough to gasp my name. The grip around my heart tightened, even though I’d known all along the call was meant for me. “Yes, speaking. What’s wrong?” There was no point wasting time with idle chitchat. Obviously something was wrong—very wrong. Another gust of wind knocked my skull against the side of the building and pain jolted through my brain. The caller was silent for so long I ordinarily would have assumed she’d hung up, lost her nerve. It happened. It wasn’t easy for people to admit they needed my help. It was a leap of faith, a willingness to open their minds to the possibility that something they’d spent their entire lives denying could be real after all. But the wind told me otherwise. I waited for her to speak again, raising one arm between my face and the building to protect my head. The chill had seeped into my bones, and what I wanted more than anything was to run home and immerse myself in a steaming hot bath while I drank a cup of the pumpkin spice tea I’d just purchased. I didn’t want to talk to this woman. I didn’t want to hear about what terrible things were happening at her home, for surely terrible things were happening. But I’d learned long ago that my gift was bigger than me, and if this woman needed it, I wasn’t going to turn away from her. I could feel curious eyes burning into me, watching me struggle to stay on my feet. Pushing my hair away from my face, I risked a glimpse and was immediately sorry I had. The leaves around my feet had arranged themselves in the form of a girl, a girl not much shorter than me. As I stared, my pulse throbbing behind my temples, the terrifying apparition raised a rustling arm toward me before collapsing onto the sidewalk. On the day the villagers were forced to flee Hensu, not everyone got out alive. 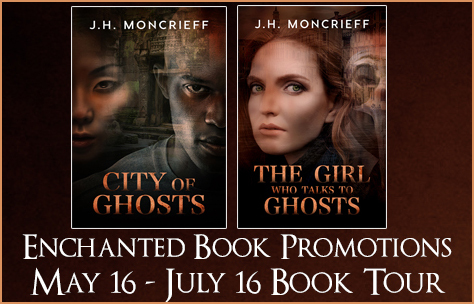 Jackson Stone is touring the abandoned Chinese city when he slips away from the group to spend the night, determined to publish an account of his ghostly experiences there. Then he meets Yuèhai, a strange, soft-spoken woman who can tell him the city’s secrets—secrets the Chinese government would kill to keep hidden. As Jackson uncovers the truth about Yuèhai and the ghost city, he’s drawn into a web of conspiracy, betrayal, and murder. He must risk everything to save himself and bring honor back to Yuèhai and her family. Would you risk everything to save a stranger? Off the coast of Venice lurks Poveglia, the world’s most haunted isle, steeped in centuries of innocent blood. A deranged doctor who took great joy in torturing his patients in life continues to rule his abandoned asylum after death. Few go to Poveglia willingly, but medium Kate Carlsson has no choice. It’s her job. While struggling to retrieve a young girl’s soul, Kate uncovers some shocking truths about the evil on the island that challenges her own convictions and morals—and even her life. Is saving Lily worth making a deal with the infamous Doctor of Death, or is the price too high to pay? J.H. Moncrieff’s work has been described as early Gillian Flynn with a little Ray Bradbury and Stephen King thrown in for good measure. She won Harlequin’s search for the next Gillian Flynn in 2016. 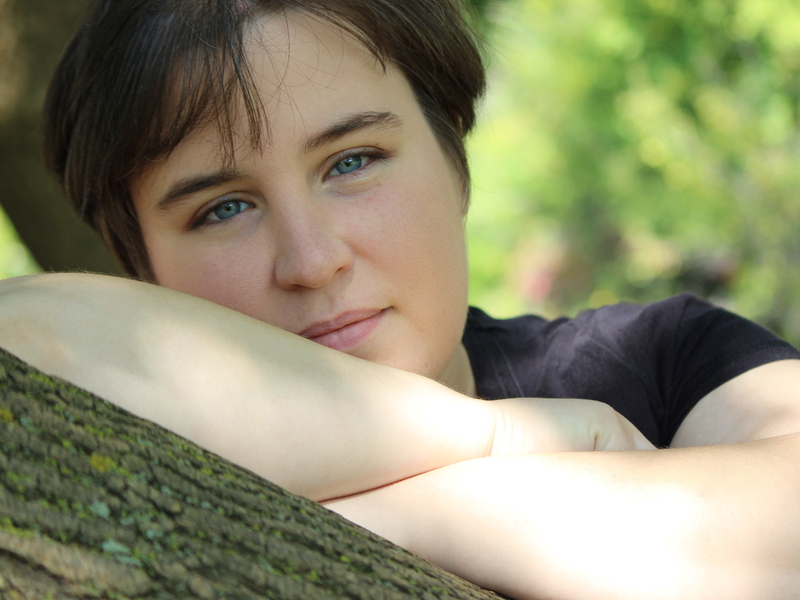 Her first published novella, The Bear Who Wouldn’t Leave, was featured in Samhain’s Childhood Fears collection and stayed on its horror bestsellers list for over a year. When not writing, she loves exploring the world’s most haunted places, advocating for animal rights, and summoning her inner ninja in muay thai class. To get free eBooks and a new spooky story every week, go to http://bit.ly/MoncrieffLibrary . In a city built on legends, the truth is hard to find. 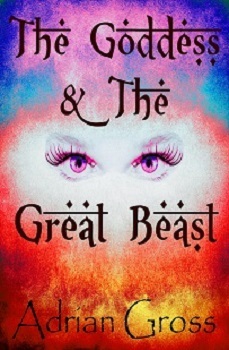 This is a novel-length fantasy based in modern-day New Orleans and inspired by The Hardy Boys and Nancy Drew, with maybe a little bit of The Goonies and Scooby-Doo. 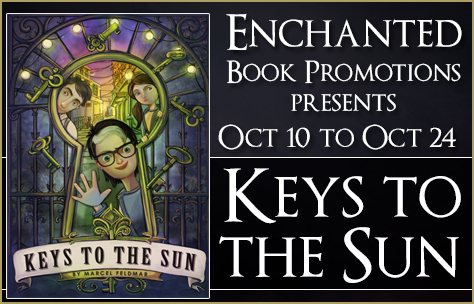 Keys To The Sun is a mystery tale about three teenagers on vacation in New Orleans who find more than they bargained for when they discover a secret attic in an old mansion. Lucas and Parker Chance, with their new friend Nicole Wells, find an old map and mysterious clues that promise to lead them to a long lost pirate’s treasure. With the help of their enigmatic Aunt Ruby they begin to search through the French Quarter, but soon realize they are not alone in their quest, and find themselves caught between the forces of good and evil as the treasure turns out to be the location of the legendary House of the Rising Sun. Marcel Feldmar was born in Vancouver, moved to Boulder, ended up in Denver, went back to Vancouver, moved to Seattle, and ended up in Los Angeles. He is married with three dogs, and enjoys fancy cocktails. He is also a coffee addict and an ex-drummer for too many bands to mention. Marcel attended the writing program at the Naropa Institute (otherwise known as the Jack Kerouac School of Disembodied Poetics) and moved through a few college creative writing courses in Vancouver (Canada). He was distracted by music for a few years, but finally decided to trade in the drumsticks for a pen, and proceeded to write his first novel — The Devil’s Jukebox. After the book writing block was removed, the words started to flow. He is currently working on a more adult tale that falls into a similar style, which has been called “Paranormal Pop Fiction”, but evidently he is also starting to work on ideas for a sequel to Keys To The Sun. 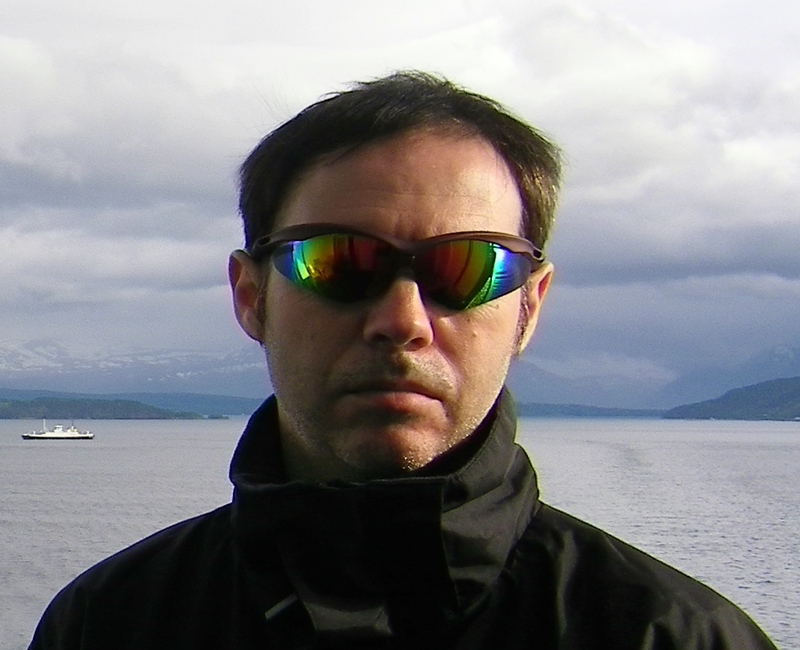 Today I’m hosting a guest post by John O’Riley, author of supernatural novel “Dark Energy”. Welcome to my blog, John, and thanks for guest blogging here today. I’ve been writing as far back as I remember. It started clear back in grade school with short stories that usually revolved around my family or my pet which was a beautiful cinnamon cocker spaniel named Rudy. Magic, the paranormal, psychics, and science fiction always intrigued me as well as sparked my imagination. Inspiration comes to me all the time and can come from anything including a chat with a friend, a dream or a nightmare, or something I see in the newspaper. I love reading which I think as an absolute must for a writer. I usually tend to read contemporary fantasy but sometimes will read science fiction like S.L. Viehl. I was captivated by her Stardoc series and wish she hadn’t stopped writing them. I do sometimes like young adult fantasy as well which can provide some very unique story lines like the J.K. Rowling Harry Potter series and the Cassandra Claire Mortal Instruments series. 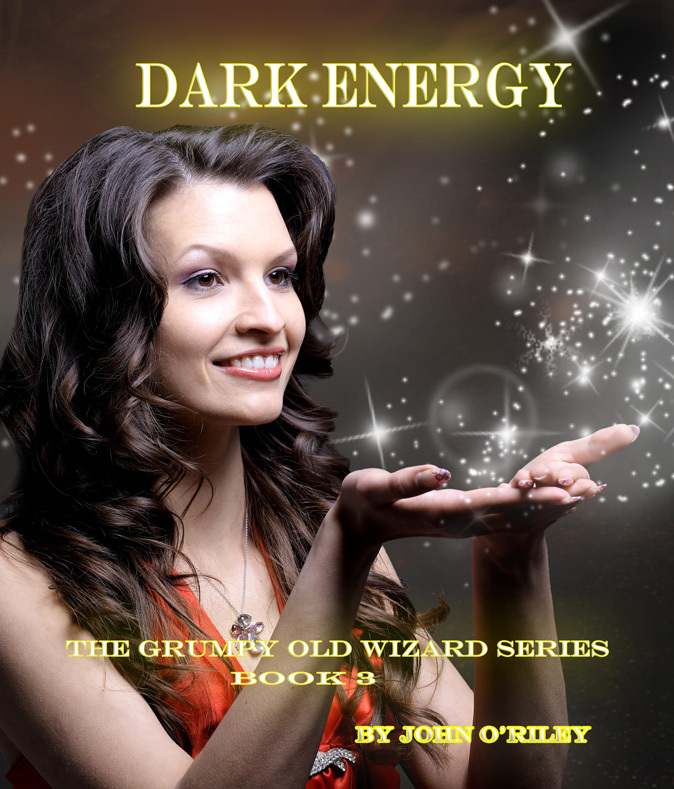 My latest book is called Dark Energy and is the third installment in the Grumpy Old Wizard series. Like the other books in the series, Dark Energy is an urban fantasy. It’s a fun adventure and I throw in dashes of subtle and sometimes sly humor that will hopefully illicit a chuckle or two for my readers. The setting is contemporary and takes place in Sarasota, Florida in the near future about fifty years after a magical catastrophe that causes almost everyone in the world to become wizards. The protagonist is a special breed of wizard called a category six with a lot more fire power than the normal wizard and a few extra abilities thrown into the mix. You can visit my website at http://johnoriley.webs.com to see all titles available including the Grumpy Old Wizards series. John O’Riley was born in the sunny state of California and raised in the not so sunny state of Washington. He has a Bachelor’s degree in Spanish and French and worked in a variety of bookstores including Borders and was the manager for one of the bookstores in Florida that was actually owned by Goodwill. He loves reading fantasy, science fiction, and humorous fiction. Some of his favorite authors include Kim Harrison, Jim Butcher, S.J. Viehl, Kat Richardson, J.K. Rowling, Angie Sage, Jayne Krentz, and Janet Evanovich. He currently resides in Washington state and owns a parakeet named Amy who cheers him on with her canary-like singing. He has been writing as far back as he can remember. He is an author of novels and an award winning writer of screenplays in the category of urban fantasy, comedy, mystery, science fiction and young adult. His movie feature screenplay, Cursed, is an Honorable Mention Winner for the 2012 Screenplay Festival. His most recent accomplishments include the screenplays Cursed, Project Pandora, Pinky Swear, Incipio, and Bad Sister which have been listed as Quarter Finalists, Semi Finalists, and Top Finalists in the 2012 Screenplay Festival, 2012 Filmmakers International Screenplay Awards, 2012 StoryPros International Awards, 2012 Pulsar Sci Fi Screenplay Contest, and the 2012 Reel Authors International Breakout. You can win an eBook copy of “Dark Energy” today. All you have to do to participate, is leave a comment here. Good luck! 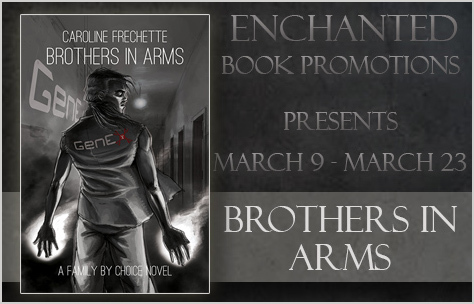 I’m hosting a guest post today for the book tour for supernatural novel “Brothers in Arms”. The guest post talks about superhumans. It definitely sounds interesting. Enjoy! I grew up reading comics. Some of my fondest childhood memories revolve around lying with my cousin in a dusty attic or under a tent we had set up for backyard sleepovers poring over our favorite titles. We read them all, DC and Marvel, from the most well-known titles to obscure books that had belonged to our fathers or uncles and that we would have never known about if we hadn’t dug all the way to the bottom of the box. In the day time, we wore capes and enacted our own adventures, and even wrote our own comics, though they nearly always ended up being parodies of what we perceived as a world that was very much good vs. evil, one extreme to the other. It was all very simple – you were either a superhero or a supervillain. Having grown up fascinated by this world, it’s only natural that it seeped back into my writing. Coming with it, a bit unexpectedly, was that unease that I had always felt toward it, even as a child: human beings can’t be this simple. No one is good, or evil; everyone is the sum of their experiences, and good and evil are, most often, just a matter of perspective. Above all, everyone tries to do what they think is best, no matter how ill-advised it might seem to others. This is why I tend to use the term “superhuman” rather than “superhero”; “human” is the operative part of the word, and not every human with a superpower would necessarily fall into this binary world of good or evil. The Family By Choice series, of which Brothers In Arms is the second book, was the ideal opportunity for me to explore this idea. The main character, Alex, is as flawed as they come – he’s a man who wears the fresh scars of a heavy past, and he works for a criminal organization. At first glance, he has all the makings of a supervillain, but he is the hero of the story. He is not heroic in any classic definition of the term; he is a deeply conflicted person, trying to protect the ones he loves, having a hard time keeping up with a life of crime he chose out of necessity, years ago. Alex has been called an “anti-hero” by a lot, because he is flawed; but he does in fact have many heroic qualities. He is generous and altruistic, even though he can be quite abrasive; he is courageous and takes charge of things when they get difficult, although he believes he only does it because he has no choice; he is intelligent and strong-willed, although he doesn’t believe it because of his self-esteem problems. But that’s what being human is all about: imperfection. Human beings are full of contradictions. They have highs and lows, they have qualities as well as flaws, they have good parts and bad parts. There is no such thing as perfect, and when you think about it, there really can’t be any such thing, because we are all different; what would be perfect for someone would not be for someone else. Am I losing my mind, or my power? Right now, I’m not sure which would be worse. A little over a year after the events of Blood Relations, Alex Winters is doing well, with a relatively comfortable home life with his girlfriend and baby. Although his position as underboss for the Lupino group is starting to weigh on him, he truly thinks the most difficult times of his life are behind him. 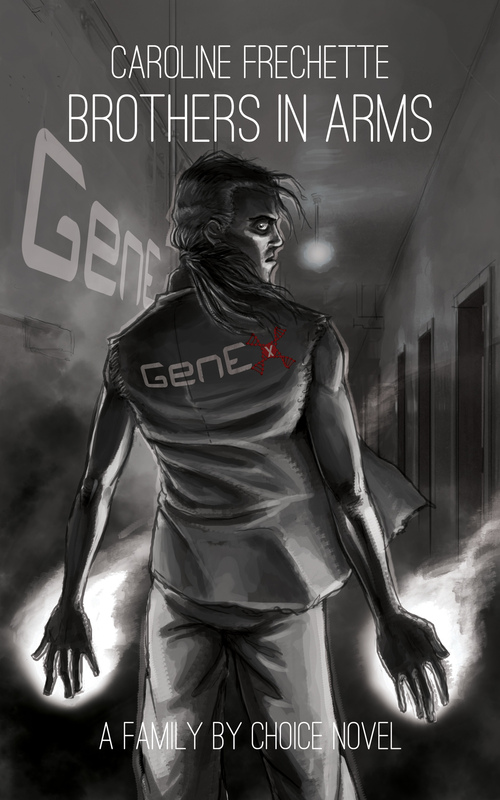 When he is approached by GenEx, and discovers that there are others with special abilities like him, he finds out just how wrong he is. You can get a free eBook copy of the “Blood Relations”, the first book in the series from March 8 to March 12 to celebrate the release of its sequel “Brothers in Arms”! Caroline Fréchette is a sequential artist and author. She has published several short stories, both sequential and traditional, as well as two graphic novels, all on the French Canadian and European markets. She was the editor and director for the French Canadian literary magazine Histoires à boire debout, and works in a library. She has been teaching creative writing since 2005, and manages the writing page Ice Cream for Zombies. 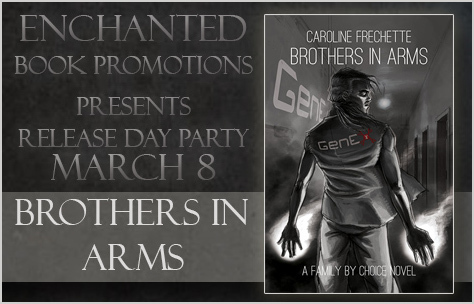 We’re celebrating the release day party for supernatural novel “Brothers in Arms” today. Happy release day party! 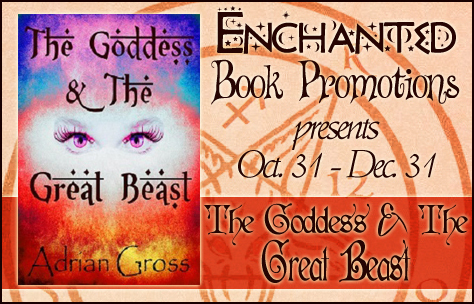 I’m hosting a snippet today from “The Goddess and The Great Beast”. Have fun reading. So, as a million stars twinkled feverishly through the hazy, drowsy air, I laboured along the alleys of old Baghdad in search of Babylon. I followed Farouk through the dark and disorienting maze, a crate of whiskey in my arms and a fluttering of excitement in my chest. Crumbling mud-brick hovels, decaying under the constant grinding erosion of the desert winds that swept in from the north, rubbed shoulders with rusting corrugated iron shacks that were slowly being eaten away by the waves of salty air that drifted over from the Bahr al-Milh, the Lake of Salt, to the south-west. Every now and then a modern concrete hotel in the now slightly passé, and slightly tatty, Art Deco style stood incongruously amid the rows of impoverished shops and dwellings and ruins. The streets were haphazardly lit, but busy with a tumbling mass of people and animals who all seemed to be watching me with glazed, empty stares. I felt as if I was under constant surveillance, although my observers had no interest whatsoever in what I was doing. I tried to ignore my paranoia and not lose sight of Farouk. Baghdad itself was an Arab development, an eighth century new-town, but, like most major cities, it had hosted an ever-shifting population of many different peoples and their many forms of belief over the years. According to Farouk what remained included a very small oasis of the old Babylonian religion which had been here before Baghdad. I didn’t know whether to believe him. It all sounded a bit far-fetched. Well, a lot far-fetched, but he seemed as genuine about this as he was whenever a shipment of any sort of contraband was involved, and I was desperate for some excitement, so I suspended my disbelief and kept following him. Babylon itself, of course, had long since faded into uncertain memory, a misunderstood myth amid impenetrable desert ruins. However, as there had been Jews in the Babylonian world and there were still Jews in the modern world, despite Adolf’s best efforts, I was hopeful that maybe Farouk’s Babylonian sect had been equally tenacious, or bloody-minded, and preserved their unrestrained pagan rituals down the millennia for my enlightenment. At the very least I hoped a night of heathen entertainment would relieve my stifling ennui. My heart was now thumping in anticipation of the possibility that I just might be about to witness a living relic of ancient Babylonia. There was also the effort of carrying a case of bottles of whiskey through the steamy, humid night. Farouk had graciously offered for his boy to carry the burden, but I wasn’t sure I trusted him either to manage the heavy and awkward box, or to not just run off with it and devour the entire contents in some abandoned wadi on the edge of town. 1942: a bored British soldier in Baghdad; a beautiful Babylonian Goddess; a sacred marriage unconsummated. Five years later, in a dreary post-war London, the Goddess must be satisfied. Can anyone save her demobbed consort from eternal torment? Does he even want to be saved? And what’s it got to do with the ‘wickedest man in the world’? Adrian Gross is a British writer. Some bits of him used to be Irish and some others were once Hungarian. He lives close to Glastonbury and likes to bang his little heavy metal head whilst drinking chewy real ale! He has endured many terrible jobs, including adrenaline-junkie motorcycle courier, record shop dude-with-bad-attitude, and air traffic control disaster limitation assistant. When his aching bones and throbbing hangover allow, he plays football (soccer) and rides bicycles up and down the Mendip Hills.